More than 281,000 unemployed Illinoisans could see their job prospects dim should lawmakers approve Gov. J.B. Pritzker’s plan to eliminate the state’s flat income tax protection. The Senate Executive Committee on April 10 passed the Pritzker-backed Senate Joint Resolution Constitutional Amendment 1, which would allow for a graduated, or progressive income tax. But the amendment lacks protections for businesses seeking to invest in Illinois talent. In fact, the amendment would open the door for lawmakers to impose the nation’s highest corporate income tax rate. The cap remains in place under SJRCA 1 with one very important change: it would apply to the highest individual income tax rate. Under Pritzker’s “fair tax” proposal, that rate is 7.95%. Given Pritzker’s top individual income tax rate, lawmakers could pass a corporate income tax rate of up to 12.72%. And adding the state’s 2.5% Personal Property Replacement Tax would bring Illinois’ effective corporate income tax rate to a whopping 15.22%. The nation’s top marginal corporate income tax rate is 12 percent in Iowa, according to the Tax Foundation. And that’s scheduled to drop to 9.8% by 2021. 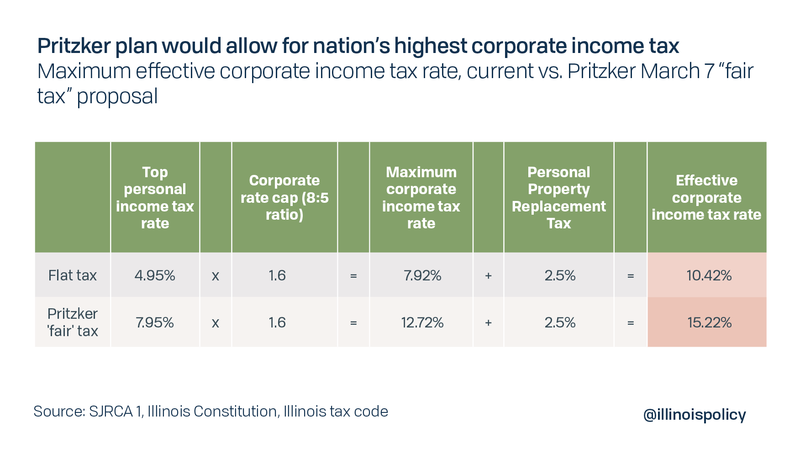 Not only would Pritzker’s amendment allow for an extraordinarily high corporate income tax, lawmakers would also be empowered to layer multiple income taxes on top of Illinoisans’ individual earnings. If Pritzker were to succeed, the constitution would lose the sentence that stops double taxation and the state could, for example, add a special income tax surcharge to pay pensions. Ultimately, the state’s spend and borrow habits mean Pritzker’s plan will become a guarantee of higher taxes on the middle class. Pritzker and state lawmakers should instead pursue sensible spending reforms that don’t require consuming more of what Illinois taxpayers earn.